How does it feel to arrive at work one day to find the doors locked permanently? Most of us can imagine how cataclysmic an event this would be; unfortunately, 1200 more workers had to experience this recently, as IQT Solutions closed its doors in Canada. Claiming bankruptcy (no official filing could be immediately located), the call centre abruptly terminated workers, trampling rights under the provincial Employment Standards Act to notice, severance and vacation pay, refusing to even honour monies owed for hours worked. The company had plans to establish a new operation in Nashville, but the city’s mayor withdrew the 1.6 million dollars that IQT was to be given in exchange for 900 jobs in the city once he learnt of the havoc the company had wreaked upon Canadian workers. Workers were undoubtedly shocked. Having been unorganized, mounting a challenge to this proved difficult, albeit not insurmountable. In Oshawa, where approximately 600 IQT jobs were lost, a long history of workers’ activism, linked to thousands of other communities, has shaped and supported local, provincial and national organizations of labour to safeguard the rights of working people. This history, and the forms of labour organization it has spawned, both help and hinder us as we face an increasingly common problem in many cities and towns – company closures. Local activists, along with supporters from the Durham Region Labour Council, the Canadian Auto Workers, the Ontario Federation of Labour and the Ontario New Democratic Party were quick to offer support and organizational aid to former IQT workers. However, the extent of support that could be offered to these newly unemployed workers is also limited by the nature and shape of the trade union movement as it has developed in the twentieth century. Efforts to broadly organize workers predate the 1930s, with the Knights of Labor, the Industrial Workers of the World and the One Big Union being particularly noteworthy examples. With the mass unemployment of the Depression era came renewed efforts to organize the unemployed. However, industrial unionism, which would go on to form the backbone of the North American trade union movement, emerged from the 1930s as the dominant form of worker organization. 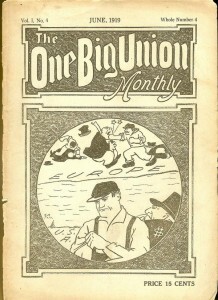 A 1937 strike in Oshawa which established the United Automobile Workers in Canada is one early example of this. Industrial unionism was a radical form of organizing at the time; whereas most workers prior to this had been organized in separate locals by skill or trade, industrial unionism brought all workers at the same company under the same union banner. High employment levels during the Second World War and well into the postwar period, along with the expulsion of “radicals” from the trade union movement early in the Cold War era, further solidified this form of organization, limiting the space for dissent against the postwar status quo. Organizing by workplace has since become the most typical form of unionism, and has laid the basis for labour organizations and labour laws in Canada. The foundation of this system of organization first trembled in Canada in the 1970s, when Dunlop Tire closed its Toronto factory. Worker protest led to changes to the Employment Standards Act and Canadian Labour Code, requiring employers in Ontarioto provide advance notice of mass terminations and severance pay. In 1980, the Houdaille Bumper plant in Oshawa closed its doors, leading workers there to occupy the plant for two weeks. Their actions brought important changes to the Employment Standards Act, encouraging pension portability and ensuring benefit payments were made through the pre-notification period that companies were required to give when closing. These gains were overall quite limited. Workers still lost their jobs, and often, their active union membership – there is little space for the unemployed within the current trade union movement. Meanwhile, company closures have become increasingly common in current decades, as the political and economic landscape has shifted to give companies greater flexibility to operate globally. Yet the labour movement continues to operate largely along the lines established in the 1930s and 1940s, on a system premised on high employment levels and national protectionism. IQT workers have shown us that when pushed far enough, workers can and will self-organize to protect their rights. The labour movement can and has been an important ally to this, offering aid and support in organizing rallies, protests and actions where affected people, unionized or not, can express their voice and demand a fair deal. At the same time, terminated workers, unionized or not, are excluded from full participation in the labour movement. If they find another job, and if it is a non-unionized workplace, if they are able to convince half of the people at their new workplace to unionize, then they will be welcome to fully participate in the labour movement. Unionization rates in North America have been steadily declining in recent years, along with the job security, benefits and good pay that organized workers have won. IQT is a reflection of this, whereby Bell Canada has contracted out what were once unionized jobs to a non-unionized third party employer. This process is also linked to the growing ascendancy of global capital in the late twentieth century in the fertile soil of neoconservative governance, and the ability of products and services (but not people) to travel freely across national borders. The times they are a-changin. The actions of IQT serves as another reminder that perhaps it’s time for the labour movement to change along with them, to re-imagine the ways that working people can belong and participate in a larger organization of working people. Alternate models may largely defy living memory in North America, but they are a part of our global history, there to learn from and help us inform future directions, if we are willing to look back far enough. No one system of organization has been perfectly successful, but there is as much to be learnt from past failures and successes which can help us to build a new, strong, successful and more inclusive movement. Until we open ourselves to different models, recent history and current conditions suggest that we will remain largely powerless in the wake of the antics of companies like IQT Solutions, and as is all too often the case, it will be workers paying the price.